To celebrate our seventh anniversary (June 13), my mother-in-law watched our kids, and Steve and I went out for a bite to eat. We dined at our favorite Italian place, and filled ourselves to the brim with stromboli and pasta. 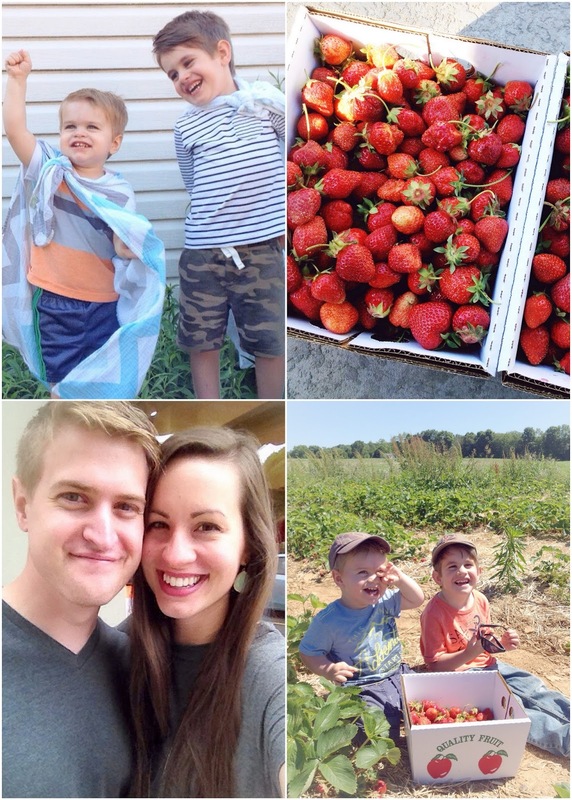 A couple of days later, we took the boys strawberry picking! It was out of town, so we added Chick-Fil-A and Target to the trip before we went to the farm. Steve had gone strawberry picking when he was in middle school, but the rest of us had never been! Ephraim was serious about finding strawberries! Nolan picked a few and was done, but Ephraim kept going the entire time. He wanted his box to be full! The strawberries were shinier and brighter than store-bought, and they tasted amazing! Steve was a strawberry-picking machine. We ended up with four big boxes of strawberries. My mom and Don were out of town, so we checked on their house and played on their swingset a few times. The other day, Nolan decided he had to have a cape. And if Nolan has one, Ephraim wants one too. They were the CUTEST little superheroes! On Saturday night, our town was having its annual Fireman's Parade. The boys saw this super tiny 8-week chihuahua puppy. They couldn't believe it was as small as Hammie, and in the photo, Nolan is holding Hammie up to compare. We counted about 22 red, blue, and yellow firetrucks! And the boys collected a huge pile of candy and bouncy balls. That night, we headed to the town's fireworks. I haven't let the boys stay up that late in years past, but I thought Nolan would love to see them! We didn't tell them ahead of time what was happening, so N was super excited when the fireworks started. He was so amazed, and kept saying things like, "This is so great!" Sunday (Father's Day) marked 25 years since my dad passed away. Every few years this day falls on Father's Day, and therefore I've never been a huge fan of the holiday. I just can't wait to see him again one day. On Tuesday night, some of my MOPS friends and I had dinner on a fancy parlor train car. Dessert was creme brulee, and it was delicious! We switched Ivy's food in May, and she also swallowed a baby wipe, so she's been having stomach trouble for a month. She was so lethargic that I took her to the vet a few days ago, and the vet really didn't know what to do with her. Luckily, she seems to be doing much better the past couple of days, and we hope she proves to be resilient once again! Rainy Thursday afternoons are for going to the library with friends! This little cutie knows how to spell his name, and he can count from 1-11! Today, we spent the afternoon at the pool, and now the boys are resting. Hope you all have a sunny and relaxing weekend! Aw look at those sweet boys. You look great! And yum to that creme brulee. That is one of my favorite desserts! It looks like they both had so much fun!